Every year, the Ready by 21 National Meeting brings together hundreds of leaders from around the country who are working to get all young people ready by 21 – for college, work and life. These leaders have dedicated themselves to improving the odds for children and youth through collective impact initiatives, policy alignment and program quality improvement. 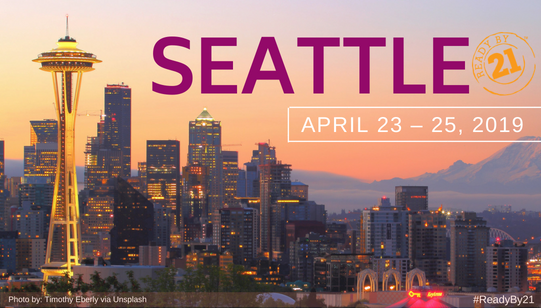 In 2019, over 500 leaders will convene April 23-25 in Seattle, Washington for the 8th annual Ready by 21 National Meeting! You'll hear strategies, research and stories about partnering for better impact, aligning policies, improving program quality and performance, and embracing readiness in the pursuit of equity. From the world-famous Pike Place Market to the Space Needle, you'll enjoy Seattle's breathtaking natural scenery and lively metropolitan area. There will be dozens of stimulating workshops and sessions from top leaders in education, policymaking, advocacy and out-of-school time. With the goal of ensuring all children and youth are ready by 21, essential topics such as defining and ensuring readiness, promoting equity, increasing shared commitments and impact, improving program quality and supporting social and emotional learning (SEL) skills will be highlighted. At the core of the Ready by 21 National Meeting are the workshops that educate and inspire the hundreds of leaders in attendance to do the ground work in ensuring that all young people are ready to succeed. Our workshops are designed to provide varying levels of content and presentation formats in order to better equip communities of all shapes and those in various stages of change. Ensure Readiness for college, work and life, by building competencies, abilities and mindsets. Promote Equity for all young people, and especially closing gaps for populations often facing great challenges (e.g. boys & young men of color, opportunity youth, youth in foster care, pregnant & parenting youth, etc.). Increase Shared Commitment to changing the odds for young people through common goals, strategies and measures within and across systems & sectors. Improve Program Quality and effectiveness in ways that spark management & staff engagement and support better outcomes for young people. Further insight into these themes is available here. "It was great to be in an environment with people that are doing similar work and being able to get training to make me better at what I do." "Speakers were excellent and inspiring. Workshop topics were great and it was hard to choose one per session. Welcoming and Networking Reception was awesome. Great job! Food was great. Overall great experience for a first time attendee." "I really enjoyed the open sharing of ideas. Everyone encouraged attendees to take all information back to their communities and share out. Unlike other conferences, no one was trying to sell me anything which I really appreciated." "Very organized meeting, informative and to the point. It was great to meet people from very different programs and different states." “The atmosphere is lively and cordial. I feel like everyone is open to talking and learning from one another. Having folks in the room that really get it and can be honest with their struggles is so important." “The many and wide variety of breakout sessions. Lots of great topics to choose from. The three breakout sessions I attended were full of helpful insights and tools to take back for immediate implementation."